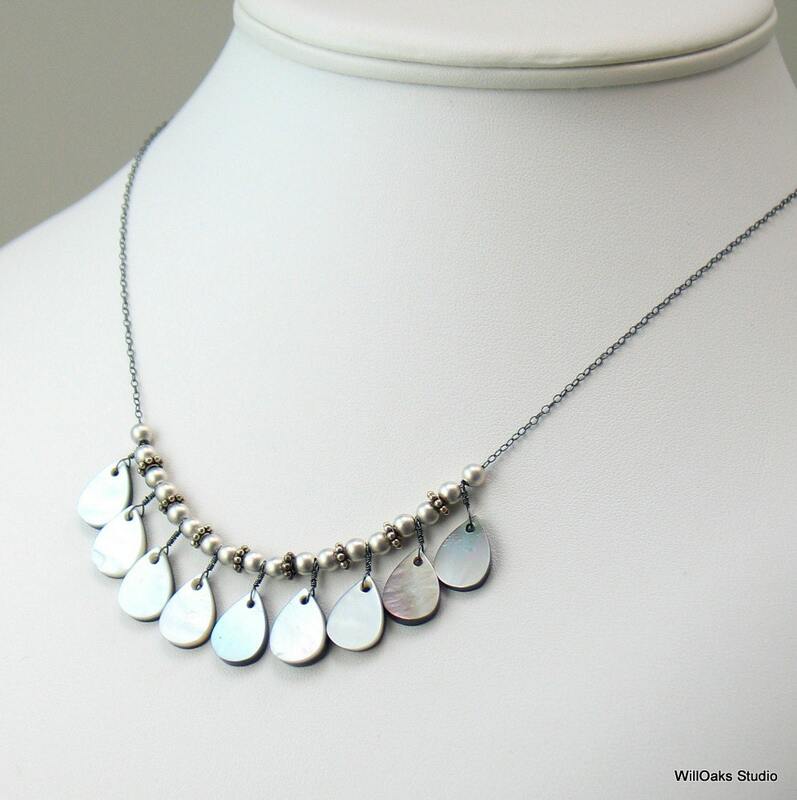 A rich texture of silver beads along a dark oxidized sterling chain with a row of black lip shell teardrops for an elegant necklace to wear as black or white as it happens to be reversible, too. 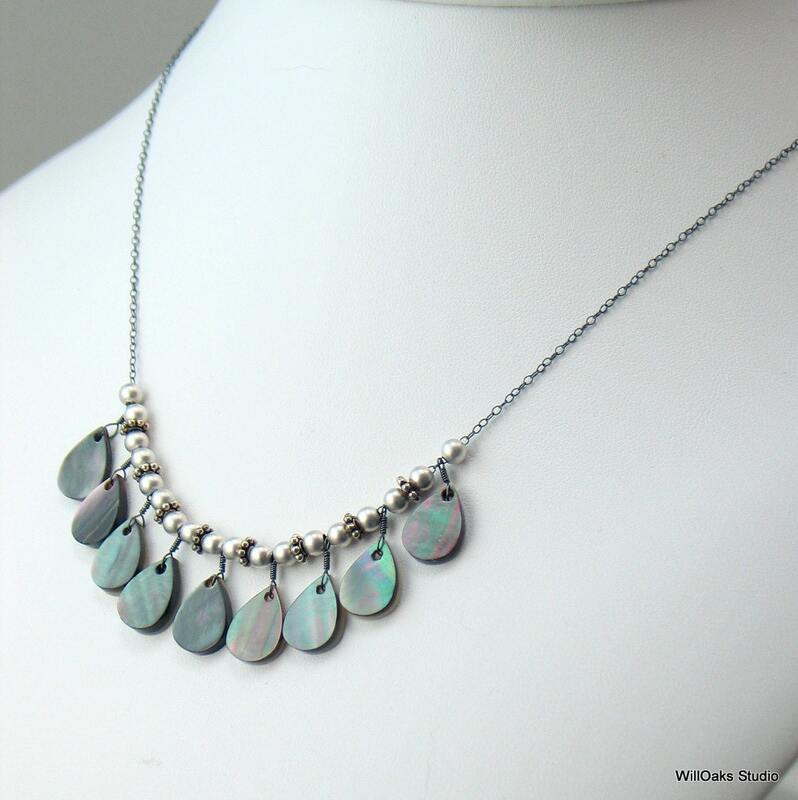 For business to casual, to cross seasons, and to dress up or down, this original artisan design features a mix of dark and light sterling silver and two-sided, dark gray and pale gray luminous shell teardrops. Teardrop shapes cut from black lip shell are about 1/2" high, and are wire wrapped with sterling to create loops. Then these are strung with satin finish 4 mm sterling beads and Bali Silver beaded rondelles to create an elegant rhythm along a fine 1 mm oxidized sterling silver cable chain. 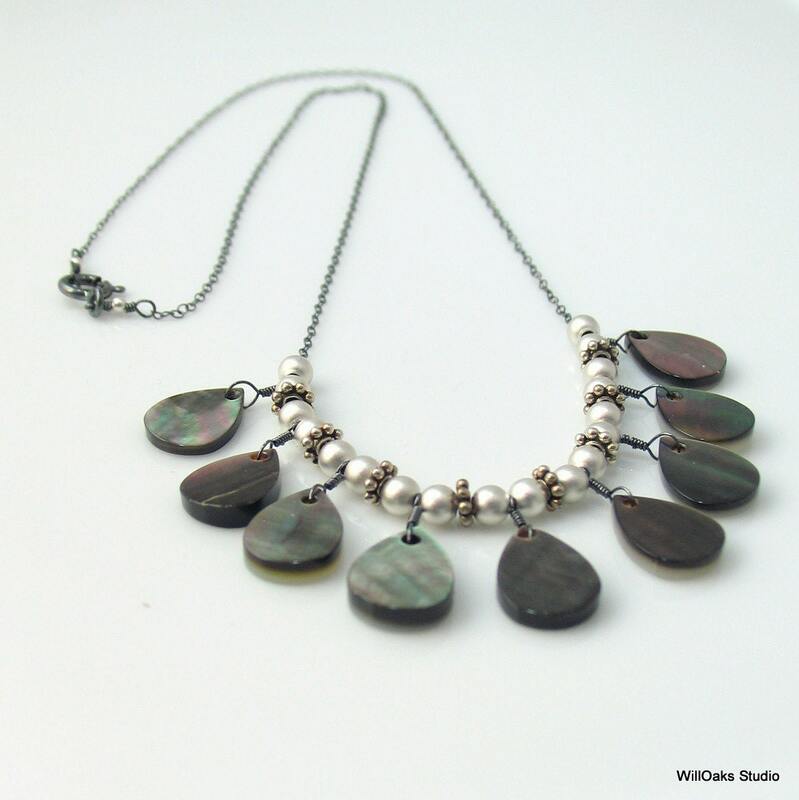 As a bonus, each shell teardrop is darker on one side and paler on the other, making this necklace reversible for 2 looks, a natural version of black or white. The beaded part of the necklace is about 3 1/4" across and drops about 3/4" in width. Total chain length is just over 19", and this length can shortened upon purchase- please leave length in “notes to seller.” Closes with an oxidized sterling spring clasp bracketed by two tiny satin finish sterling beads. All handmade made and assembled in my studio and my original design. Presented in my custom signature box, for gifting or for keeping. An elegant artisan original to be enjoyed for years to come. 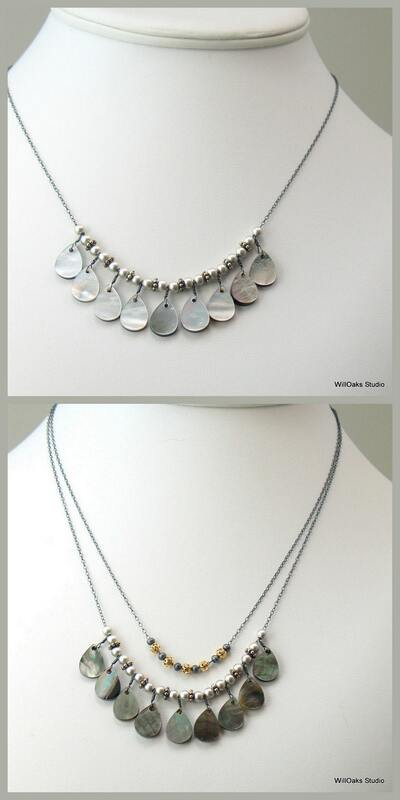 Easy to wear necklace that goes with almost everything! 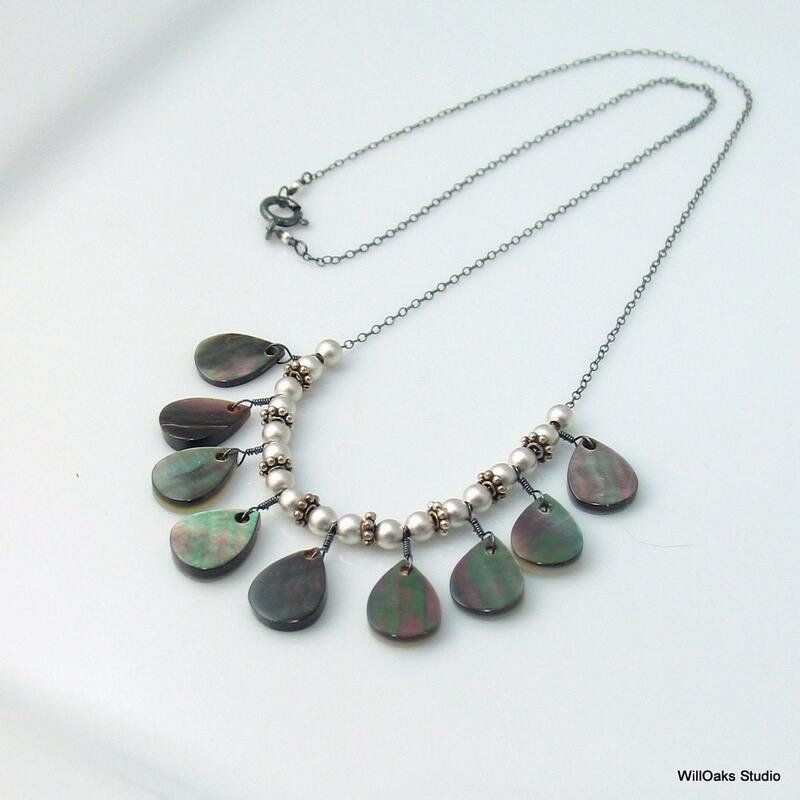 Very pretty and versatile piece! Only problem is that the spacer beads do not move freely on the chain and get stuck, so there are big spaces between the beads. Requires some adjustment at each wearing.